One of the hardest things about dealing with food allergies is not being able to buy a cake or throw one together fast...this recipe is the fastest you can ​get when it comes to making it yourself! And it's so moist and delicious, everyone will be asking for a second piece (the second-piece request is not common with gluten free, vegan cakes). Dairy, egg, nut, and gluten free! 1Preheat oven to 350°. Grease 9" round layer cake pans with a little extra butter and then sprinkle with flour (gluten free if avoiding gluten) and tilt cake pan until evenly coated with flour over the greased layer. This is really key to helping a gluten free cake crawl up the sides of the pan and rise (gluten free things REALLY hate rising). Tap the cake pans until the flour is even and then turn over and tap any remaining flour out so it doesn't bake into the sides of your cake. 2​Open the cake mix and empty into a large mixing bowl. In a separate bowl or large measuring cup, add the vegetable oil and water (if cooking with your kids, great opportunity to discuss fractions while measuring AND density when the oil sits on top of the water). 3Pour the oil and water "mixture" into the cake mix and stir. If you have not prepared your egg replacer yet, warm your 8tb of water, add the 8tsp of mix, stir until frothy, and then add to the cake mix. Add 1 cup of yogurt. Whisk until batter is mixed and light. I've found that the key to getting a less dense, risen gluten-free cake is to really whip air into the batter before gently pouring into the pans. It doesn't have the gluten to power the rise, so you have to trick the batter into rising. 5​While the cake is baking, set about to prepare your frosting/filling. Dump that vegetable oil spread into your stand mixer (or large bowl and mix yourself), add the whisk attachment, and whisk away to light fluffiness. Plop the cream cheese in and continue to whip it up. Slow down the mixer to the lowest setting, add vanilla, and once incorporated, mix at a high speed yet again. Grab your powdered sugar, TURN DOWN YOUR MIXER TO LOW, and add it cup by cup. This will totally blow into your face if you don't have your speed low (which may delight your children and make the air in your kitchen taste amazing, but usually not ideal for clean up). Every once in awhile, once the sugar is incorporated enough, increase your speed to whip it again and give it a taste. You really want it to get nice and thick like a frosting from a store, and the key to that is to keep adding it bit by bit until you get the right consistency. Don't forget, it will also firm up a bit in the fridge after, so don't worry if it's not PERFECT in the bowl. Once you've got the right texture, put your bowl in the fridge to set. Enjoy the whisk. 6Pull out your cakes to cool in the pan. When they've cooled enough, use a piece of parchment paper over the top, flip them over, and let the cakes fall onto the prepared parchment paper on a flat surface. Do this even if using a cooling rack. This cake is so moist, and the cooling rack will cut into the cake if transferred directly to it. 7Place first layer smooth side down onto cake stand. If you are looking to keep this neat and tidy, I would split the frosting into two bowls (one for the first layer, which gets a bit crumby as you apply it to the cake, and one for a cleaner second layer). 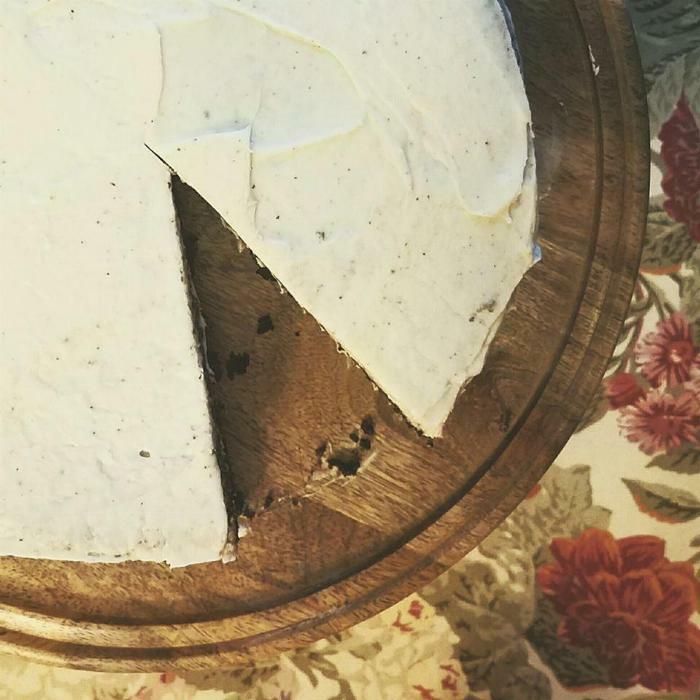 If you don't mind a more rustic look, with some cake showing through or some crumbs in the icing (cookies and creme style), then you'll be fine with your one bowl of icing. 8​Take your frosting/filling from the fridge and plop a big dollop on the top, then use an icing spatula to spread a nice thick layer across the cake. You want a good half inch of filling in there. 9Place the next layer, smooth side up, on top of your filling layer. Place another dollop on top of the cake and smooth out again, as well as around the sides. There are no big rules to icing a cake. You get to decide how much frosting you like or what your audience might prefer. My entire family is not big on a lot of frosting, so I try not to use too much, particularly when there is a filling in the center. Tidy up your cake stand when finished and put in the fridge if you can to set. You should also do this if you are going to apply a second, neater layer, as you want the first layer to set a bit before applying another.